For this mani I painted my nails with Revlon 510 Sassy (2 coats). This polish is almost a one-coater, and it dries reasonably quickly. I like it! I thought the green base would be great for a very early Halloween mani, but I decided to go with a simple floral pattern instead. 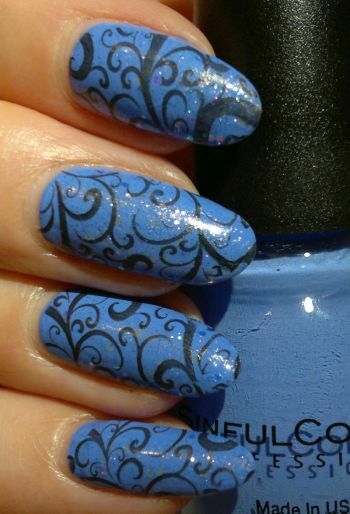 I used Pueen‘s 74 stamping plate (which is part of Pueen‘s Buffet Leisure stamping plate collection). 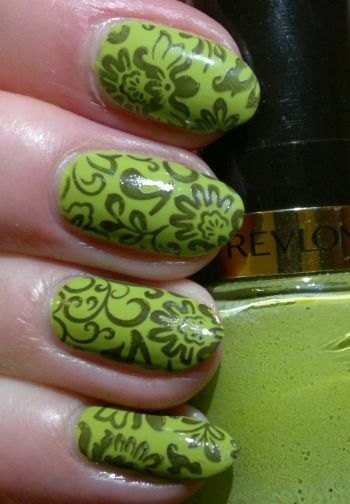 For this mani I painted my nails with Rimmel Lycra Pro 311 Spring Yellow (2 coats). This isn’t the greatest yellow nail polish because it’s quite thin. I know from experience that, with this polish, 4 coats aren’t enough for an opaque finish. So this time I thought I’d do some easy nail art. I used a small piece of a make-up sponge to apply random blobs of colour polish. I used Max Factor Glossfinity 95 Flaming Pink and Rimmel Lasting Finish Pro 370 Wild Orchid. Then I used Pueen‘s 74 plate (which is part of Pueen‘s Buffet Leisure stamping plate collection) and a home-made black “stamping” polish for the images. I really liked this mani. It was happy and cololurful and definitely something else! Do you like yellow nail polish? Feel free to comment. And thanks for reading! 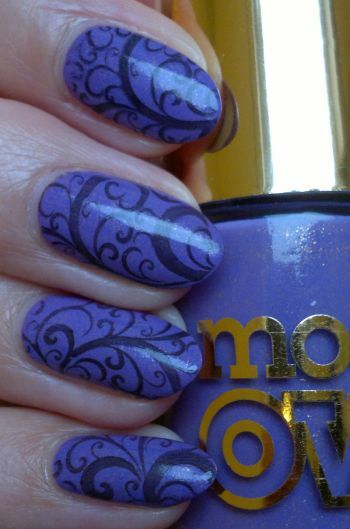 For this mani I painted my nails with Astor Fashion Studio 006 Acid Drop (2 coats). I like this polish! The cucumber shade looks fresh (great for spring and summer manis), and I like the micro-shimmer. 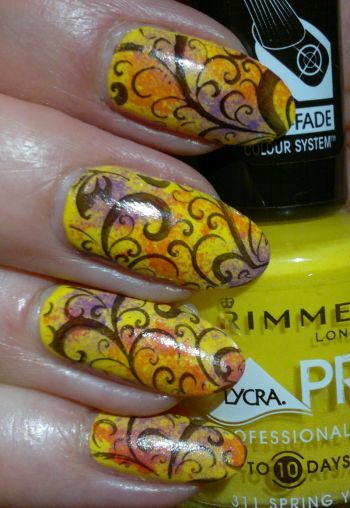 I stamped with Rimmel Salon Pro 361 Acid House. And the stamping plate I used is Pueen‘s 74 plate (which is part of Pueen‘s Buffet Leisure collection. I think this mani looks alright. The images on the index and ring fingers didn’t stamp perfectly (it’s the same on my left hand). But all in all, I think this is a nice little mani that’s perfect to welcome spring! 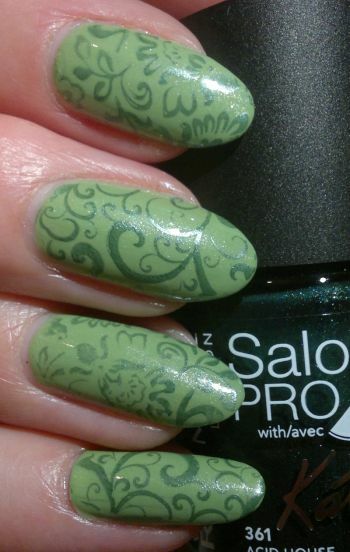 What do you think of green manis? Feel free to comment. And thanks for reading! 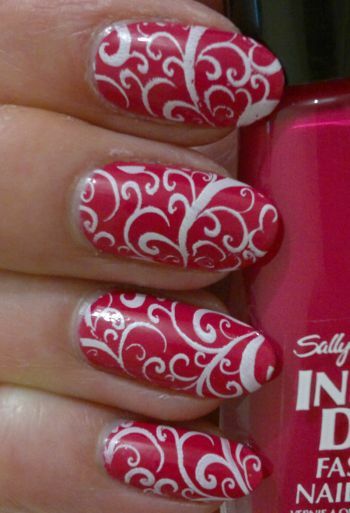 For this mani I painted my nails with Sally Hansen Insta-Dri Magenta Moves (2 coats). I love this polish. It’s almost a one-coater, it dries really fast, and the colour pops! Initially I wanted to do a glitter mani, but then I opted for stamping. I chose a remotely floral image from Pueen’s 74 plate (which is part of Pueen’s Buffet Leisure collection). The white polish I stamped with is Essence’s fantastic white stamping polish (they call it stampy polish). Feel free to comment if you want to. And thanks for reading!